We're back after midterm week, and happier than ever to do todays post.This is one of my favorite throwback caps in the business, the old school Baltimore Orioles fitted. The Orioles have been around since 1894 and have quite the history. The Original team incarnation eventually became the New York Yankees that we know and love today, but they exist now due to the move from St. Louis of the original Browns franchise. The Orioles have had 2 ball parks in Baltimore, Memorial Stadium, and their current address Oriole Park at Camden Yards. The franchise had managed to somehow win seven American League Pennants, and 3 World Series titles; there last being in 1983. Some of the more notable personalities in Oriole history are: Earl Weaver, Brooks Robinson, Cal Ripken Jr. Frank Robinson, Jim Palmer, and more recent stars such as Miguel Tejada. 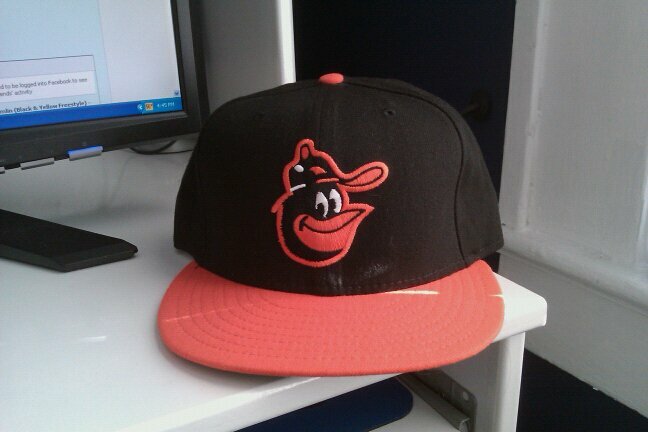 The cap above, which features a black crown, orange brim, and a smiling oriole with a cap on, I picked up at a shop in the inner harbor in Baltimore a few years back. The team hasn't been good in a while, but with a strong past such as theirs they are sure to make a resurgence in years to come. Due to their nature of an American League Eastern division team like my Bronx Bombers, I cant claim a fan-hood in this club...This ones for the birds as they say. You can find the cap below.